The Berryessa BART Station has been designed to support all modes of travel. A strong focus on the needs of the bicyclist and pedestrian includes amenities well-beyond the station’s doorways. The Berryessa BART Station’s bike facilities include more than 180 bicycle parking spaces including several options: 120 self-service indoor bicycle storage spaces with BikeLink access technology, 20 eLockers (also BikeLink technology), 40 standard bike racks and a 35-space Bay Area Bike Share station. Bicycle parking is located in the north and south station entrance plazas. Upper Penitencia Creek Trail has been extended from King Road into the station, through a grant-funded joint project. The trail contains educational displays about the creek habitat, wildlife, and the history of American Indians that historically lived in the area. This 12’ wide paved trail is designated as the Bay Area Ridge Trail; a regional and developing trail system connecting communities, parks and open space preserves. The project also included a new traffic signal and crosswalks at the intersection of King Road and Salamoni Court to provide safer crossing. Berryessa and Mabury roads were widened to accommodate six-foot wide on-street bike lanes and directional curb ramps from both streets onto a 12-foot-wide separated bikeway or “cycletrack.” This path runs parallel to the new station entrance street; Berryessa Station Way, connecting with Mabury and Berryessa roads and the Upper Penitencia Creek regional trail system. Extending the existing Upper Penitencia five mile trail system closed an important gap in the trail and provided a safe crossing for bicyclists and pedestrians across King Road. The newly restored Upper Penitencia Creek connects with both the Berryessa BART Station and proposed San Jose Flea Market development site. Today, the Penitencia Creek Trail is largely intact, creating a smooth connection along the creek to Alum Rock Park and on up to Sierra Vista Open Space Preserve and beyond. 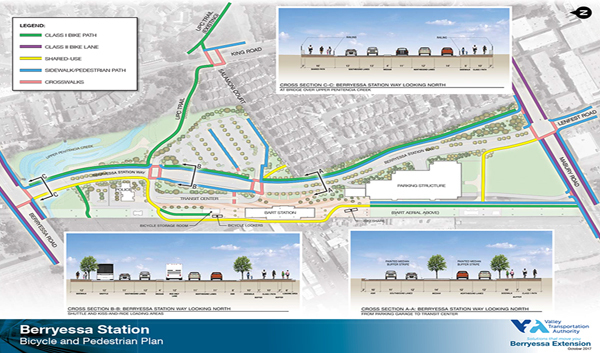 Future improvements to the nearby Coyote Creek trail system will integrate the regional trail network, ultimately connecting to the Bay shoreline to the north, and to many San Jose neighborhoods and parks to the south and ultimately to Coyote Ridge, Morgan Hill and beyond. Find out more information on the Upper Penitencia Creek Trail. The Bay Area Ridge Trail Council's mission is to create a continuous 550+-mile trail for hikers, mountain bicyclists, and equestrians along the ridgelines overlooking San Francisco Bay. The Ridge Trail also connects people and communities to nearby ridgelines and the route runs via creek trails right through the heart of the Berryessa BART station! Today, over 370 miles of the Ridge Trail are open and permanently protected for you to explore and more miles are being knit together step by step. With access points all around the region, the Ridge Trail beckons with options for active outdoor adventure, panoramic vistas, and a chance to recharge in local wilderness on your terms. The Berryessa BART Ridge Trail is your gateway – you can visit nearby parks and neighborhoods, or ridgeline peaks offering 360 degrees of fresh perspective.